A Taliban delegation and envoys backed by the Afghan government attended multinational peace talks in Moscow on Friday, the first time such a meeting has taken place publicly. The Moscow talks also abruptly highlighted Russia’s increased role in Afghanistan, 30 years after Soviet troops left the country following a disastrous war there. Russia’s foreign minister Sergey Lavrov opened the meeting in a gilded conference room at Moscow’s President-Hotel, where the two delegations sat around a circular table along with deputy foreign ministers from other regional countries, including China, Iran, Pakistan, Uzbekistan and Turkmenistan. The meeting was billed by Russia as an attempt to bring the Taliban and the U.S.-backed Afghan government closer to direct peace talks. "Russia, as the organiser of this conference, see its role as, together with the regional partners and friends of Afghanistan gathered at this table, to offer all possible assistance to launch a constructive inter-Afghan dialogue," Lavrov told the meeting. But little was expected to come out of the event, which both sides have emphasized is not a formal negotiation. 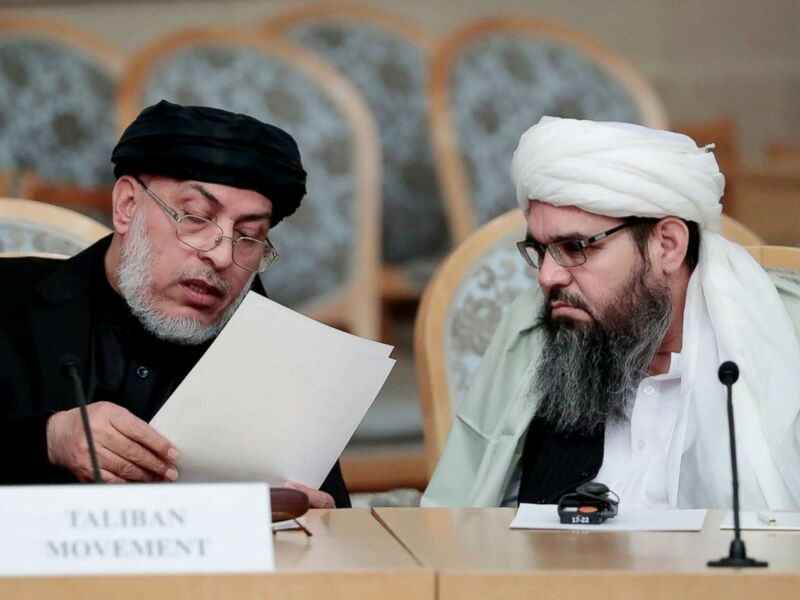 Unidentified representatives of the Afghan Taliban movement speak prior to the start of the second Moscow round of Afghanistan peace settlement talks on Nov. 9, 2018. Emerging following two hours of talks, Taliban spokesman Muhammad Sohail Shaheen reiterated the group’s position that no direct negotiations are possible until U.S. troops leave Afghanistan. Shaheen said the five-man delegation from the Taliban's diplomatic office had not spoken directly with the government-backed envoys from the Afghan High Peace Council. "It’s not a negotiation," Shaheen told reporters. "They came here to express their views, and we came here to express our views. That’s it." Habiba Sarabi, a High Peace Council delegate and a former Afghan minister for women's rights, told ABC News that the two delegations had spoken, but just exchanged pleasantries. "Just friendly talk. Nice talk," Sarabi said, noting it was her first time meeting the Taliban delegation. "Like, 'How are you? Maybe you bring another woman representative next time,'" she added, referencing the Taliban's ultra-conservative attitudes toward women's rights. The United States and the Afghan government turned down invitations to formally participate in the meeting on grounds that they support only direct talks between the government and the Taliban. Instead, the Afghan government sent the four members of the High Peace Council, a body set up to try to get peace negotiations started. The U.S. embassy in Moscow sent its first political secretary, Jacob Choi, to observe the event. Though it was expected to produce little, Friday's meeting nonetheless marked a significant diplomatic victory for Moscow, which has been seeking a more prominent role in Afghanistan. Beyond the political outreach, U.S. military officials have recently accused Russia of supplying the Taliban with weapons. Russia denies that claim, but experts believe such deliveries could be about building a relationship with the group and helping them fight Islamic State militants who have been seeking a foothold in Afghanistan. The Russian effort comes as the Trump administration is seeing its own renewed push for peace talks contrast with an intensified war in Afghanistan. This week, the White House’s special representative for Afghanistan, Zalmay Khalilzad, is touring the region, tasked with pressing the Taliban and the government to form negotiating teams. The U.S. backs a call by Afghanistan's president Ashraf Ghani for the government to hold talks with the Taliban without pre-conditions. The Taliban have so far rejected Ghani’s offer, insisting on direct talks with the U.S. The bleak reality of the war, though, provided an unchanged background on Friday. Even as the talks began, officials in Afghanistan said a Taliban attack had killed 10 soldiers. The attack on an army outpost in Takhar province happened as the U.S. envoy, Khalilzad arrived in Afghanistan to kick off his peace tour. Sarabi said the Kabul delegation had come to Moscow "to talk with all members of the meeting" and that they wanted it to lead to direct negotiations. Russia’s re-emergence in Afghan affairs, in part, reflects a broader strategy to bolster its appearance as a power-broker on the world stage. In addition to its intervention in Syria, the Kremlin has become more involved in Libya recently and has even proposed itself, so far unsuccessfully, as a possible new venue for Israel-Palestine talks. But Russia is also concerned a U.S. failure in Afghanistan will see it become a renewed source of terrorism, and is already seeking to block the flow of narcotics from the country. Opening the talks, Lavrov warned the Islamic State wants to make Afghanistan a “bridgehead” to expand into Central Asia. The Taliban spokesman, Shaheen, called Russia’s role "positive." He also denied it had supplied any weapons to the group. The smiles and warm handshakes among the Russian and Afghan delegations in some ways put into relief the difficult history that the event carried with it. The Soviet Union’s nine-year war in Afghanistan devastated the country and killed at least 14,500 Soviet troops and 90,000 of the Mujahedeen fighters who fought them. The UN estimates 700,000 to 1.3 million people were killed in the fighting. That history was on display in person in the Moscow hotel, where the High Peace Council delegation was led by Haji Deen Mohammad, a former Mujahedeen commander, now sitting in traditional dress amid the lobby’s heavy Soviet-style décor. "He’s happy to be here. They are all happy to be here," said Afghanistan’s ambassador to Russia, Dr. Abdul Qayyum Kochai. However, Kochai expressed reservations about how substantial Russia’s peace effort could be. He said Afghanistan would be grateful if Russia was “honestly” trying to bring peace, but acknowledged he wasn't sure. “That I don’t know. I wish. I wish,” Kochai said.